Preheat oven to 325° F. Oil and flour 9”x13” pan. 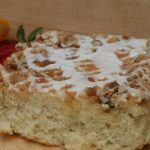 Prepare streusel – combine brown sugar, pecans and cinnamon. Set aside. Stir in sour cream and vanilla. Add Pioneer mix, blend well. Pour batter into prepared pan. Sprinkle half of streusel over batter. Swirl streusel into batter with a rubber spatula. Bake 22-25 minutes. 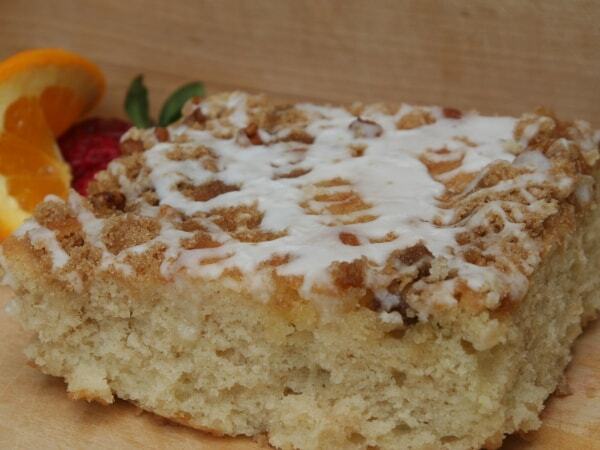 Sprinkle remaining streusel over cake; drizzle melted butter on top. Return to oven for 3-5 minutes more; remove from oven. Let cool.